Hardin/Davis Water Services, Inc. (D.B.A., HD Water Services) is an Ohio corporation established on May 18, 1995. This organization was formed to fill an industry need for technical expertise in groundwater development and protection, along with quality repair and maintenance services. HD Water Services foundation is built on the experience and dedication of its' employees. Our owners have more than 35 years of service designing, installing, repairing, and maintaining water supply and environmental systems. Having spent their entire careers working in Ohio and surrounding states, these professionals know and understand the geology and hydrogeologic characteristics of this area. Both individuals have worked closely with industrial, municipal, commercial, and agricultural clients. This allows them to understand and address each entities needs and concerns. 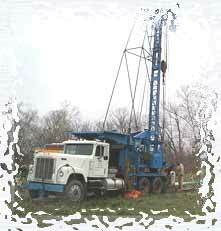 Presently, we employ eight knowledgeable foremen, experienced in the drilling, cleaning, troubleshooting, maintenance, and servicing of wells,pumps, and all treatment equipment. Each man understands and operates all of our drilling machines, service rigs, pumping equipment, and service equipment used by HD Water Services. Copyright © Hardin/Davis Water, Inc. All rights reserved. Website by Forward Function, Inc.